A slowing of the pace of growth is the latest observation to report among the most important Tallahassee real estate trends. All across the Country we are hearing about cooling markets, and it is also starting to happen here as well. Thus far, we have not seen year over year declines, but the rapid growth has definitely slowed. This is still a very healthy report and it suggests that people who want to sell a home in Tallahassee will be seeing better odds than they did a year ago. We track hundreds of different statistics here at the Tallahassee Real Estate Website, as we want to provide the most up-to-date information about home sales for our customers. Armed with this information, our homebuyers and sellers are in a better position to negotiate the best deal possible in an ever-changing market. 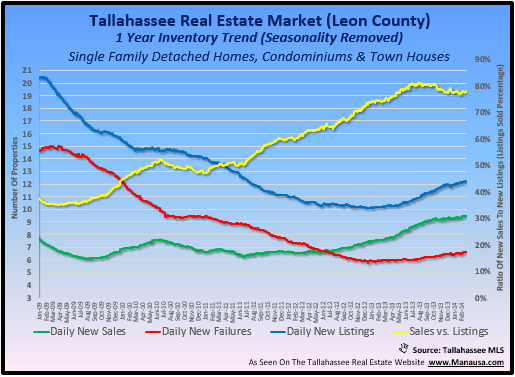 The real estate graph below features four critical Tallahassee real estate trends as they directly impact the changes that will occur in the real estate supply and demand dynamic for our area. New Listings - (Blue Line) Currently, there are just over 12 new listings each day in the Tallahassee MLS (Leon County only). This is down from more than 20 per day back in 2008, but up from 10 per day just over a year ago. This is a clear sign that sellers are testing the waters at an increasing pace. New Sales - (Green Line) Currently, there are 9.5 new sales each day in the Tallahassee real estate market. This is the highest level of daily closings recorded in more than five years, and it is up 50% from just two years ago. That that the slope of the green line is not as steep now as it was last year, but it is on the rise nevertheless. New Failures - (Red Line) In 2009, there were 15 sellers leaving the market every day having failed to sell. That level dropped to a low of six last year but has since slightly risen to nearly 7 home sales failures per day. While the failures trend is on the rise, it is important to note that it has been rising slower than have sales. Ratio Of Sales To New Listings - (Yellow Line) - The yellow line shows the one year trend of the ratio of new sales recorded to new listings taken each day. Having posted a low of 35% back in 2009, this partial measure of "success" reached a high of 81% last year. It as since cooled to just over 75% over the past 6 months. The high ratio of sales to new listings means that it is easier now to sell a home than it has been for the past five years, so if you want to make a move, now is a really good time. Take the time to interview agents with a powerful internet marketing plan for home sellers, and of course, don't forget to include us during the interviewing process!